The City of Montrose has been named the 2018 Governor’s Healthy Community Award recipient. 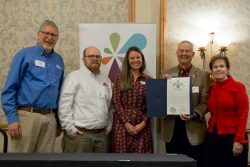 Presented in partnership by the Colorado Office of Economic Development and International Trade (OEDIT) and LiveWell Colorado, Montrose representatives received the award from Lt. Governor Donna Lynne at the LiveWell Community luncheon on November 29, 2018. OEDIT and LiveWell selected Montrose for their innovative efforts to comprehensively serve all its citizens in an equitable manner. These efforts, coupled with the city’s entrepreneurship spirit, have coalesced to create a vibrant, healthy community. The City of Montrose prioritized investing in, partnering with and supporting initiatives that positively impact the quality of life for all their citizens. While the city’s strategies serve the entire community, particular efforts have been directed to lifting up and assisting the community’s most vulnerable populations including low to moderate income-earning, homeless and Hispanic residents. “The community investments we are making now will have a long-term positive impact for the citizens of Montrose. The community used to be more adverse to change but with perseverance, collaboration and proven results, our citizens are more accepting of moving projects forward that benefit their community,” said City Manager Bill Bell. The city solicits community input through surveys and open houses to inform planning efforts.These efforts enjoy tremendous public support as evidenced by a recent voter-approved mill levy increase for the Montrose Regional Library District and a sales tax increase to build a Community Recreation Center. The Community Recreation Center opened in 2017 to an anticipated passholder enrollment of 2,700. That number has more than doubled in one year to approximately 6,800 members. Bustling with activity inside, the recreation center benefits extend outside the walls through an adjacent trail system which will eventually be part of the Great Outdoors Colorado (GOCO) Connect Trail designed to connect rural communities with feature-rich recreative and open space assets. Other recent projects that contribute to a healthy community include Partners in Integrated Care, or PIC Place, which opened in June 2017. PIC Place is the first care clinic in the nation to expand from a community dental clinic into an integrated team-based care clinic offering behavioral, dental, medical, and eye care as well as educational and vocational programming. “They took me in right away, willing to help me in so many ways and treating me like a whole person,” said Natasha Huber, a PIC Place patient. Sharing Ministries Food Bank, headquartered in Montrose, assists with food access for low-income families across five countries (Montrose, Delta, Gunnison, Ouray, and San Miguel) with the goal to provide three meals per family member three days a week, an important aspect of any healthy community. “Everybody who comes through here is treated with dignity and respect,” said Oneda Doval, Executive Director or Sharing Ministries Food Bank. Several citizens credited the City’s efforts in elevating an entrepreneurship mindset with benefitting community support organizations. Montrose Urban Renewal Authority (MURA) is a public-private partnership aimed at revitalizing blighted portions of northwestern Montrose through the creation of mixed-use commercial, light industrial and residential development. “MURA is an integral asset not only for business and economic development; but also leading further investment into preservation and access to the river,” said Mayor Roy Anderson. Combined, these all support the healthy community that is the City of Montrose. MURA is a great example of private investment partnering with public support to improve the quality of life for citizens by converging business development, housing, lodging, and outdoor recreation opportunities. These efforts, further supported by improving access to trails and open space, also fuel the river restoration project and preservation of surrounding land.